Many of our clients are becoming more and more familiar with the process of correcting or re-sizing images in Photoshop. If a task like this has become a regular part of your workflow, you may save an enormous amount of time by utilizing Photoshop’s Action Palette. 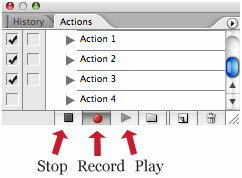 When you create an Action in Photoshop, you essentially record the work you do on a file. You then stop the recording, which ends the Action. Now, you can select a different image, press”play” on the Action palette and the system will aply the same changes to this file that were recorded. called “Website” that will automatically resize the image, change the contrast, save and close the file. Imagine how much time you will save by pressing one button instead of 20! The first step is to open an image. Next, bring down the Actions palette (Go to: Window> Actions). Click on the button in the top-right corner of the pallet (see image below) which will reveal a sub-menu. Your new Action is now “recording” your process, which mean that the effects you apply to this image will be recorded for future replay. Make any necessary modifications to the image. 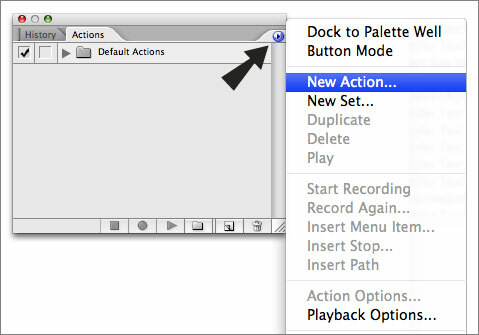 When you are finished, press the “Stop” button at the bottom of the Actions palette. Once you’ve pressed “Stop” you can go back and record more if needed. This Action will now live in our Action palette forever, until you delete it (using the garbage can icon located near the “Play” button). Now you are free to select the next image and “play” your Action to repeat the desired effects. The effects will be applied right before your eyes in quick succession. One could potentially re-size hundreds of photos in a matter of minutes.